The Attalid dynasty (/ˈætəlɪd/; Greek: Δυναστεία των Ατταλιδών Dynasteía ton Attalidón) was a Hellenistic dynasty that ruled the city of Pergamon in Asia Minor after the death of Lysimachus, a general of Alexander the Great. The kingdom was a rump state that had been left after the collapse of the Lysimachian Empire. 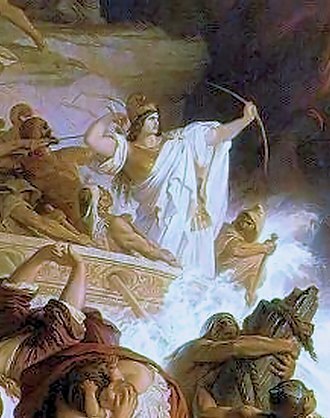 One of Lysimachus' lieutenants, Philetaerus, took control of the city in 282 BC. The later Attalids were descended from his father and expanded the city into a kingdom. In 282 BC, Philetaerus deserted Lysimachus, offering himself and the important fortress of Pergamon, along with its treasury, to Seleucus I Nicator, who defeated and killed Lysimachus at the Battle of Corupedium in 281 BC. Seleucus was killed a few months later. Philetaerus, especially after the death of Seleucus, enjoyed considerable autonomy despite being nominally under the Seleucids. He acquired considerable wealth because Pergamon had been the treasure-hold of Lysimachus and extended his power and influence beyond Pergamon. He contributed troops, money and food to the city of Cyzicus, in Mysia, for its defence against the invading Gauls, thus gaining prestige and goodwill for him and his family. He reigned for forty years and built the temple of Demeter on the acropolis, the temple of Athena (Pergamon's patron deity), and Pergamon's first palace. He added considerably to the city's fortifications. 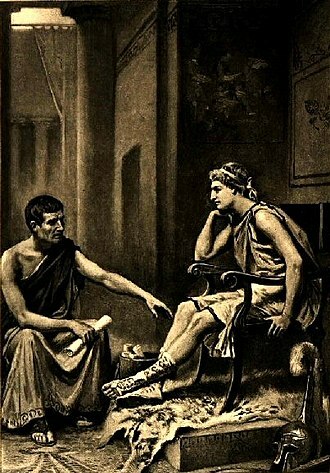 Eumenes I succeeded in 263 BC. He rebelled and defeated the Seleucid king Antiochus I Soter near the Lydian capital of Sardis in 261 BC. He freed Pergamon, and greatly increased its territories. He established garrisons, such as Philetaireia, in the north at the foot of Mount Ida, which was named after his adoptive father, and Attaleia, in the east, to the northeast of Thyatira near the sources of the river Lycus, which was named after his grandfather. He also extended his control to the south of the river Caïcus, reaching the Gulf of Cyme. He minted coins with the portrait of Philetaerus, who was still depicting the Seleucid king Seleucus I Nicator in his coins. Pausanias wrote that the greatest achievement of Attalus I (reigned 241–197 BC) was his defeat of the Gauls, by which he meant the Galatians, Celts who had migrated to central Asia Minor and established themselves as a major military power. Several years later the Galatians attacked Pergamon with the help of Antiochus Hierax, who rebelled against his brother Seleucus II Callinicus, the king of the Seleucid Empire and wanted to seize Anatolia and make it his independent kingdom. Attalus defeated the Gauls and Antiochus in the battle of Aphrodisium and in a second battle in the east. He then fought Antiochus alone in a battle near Sardis and in the Battle of the Harpasus in Caria in 229 BC. Attalus won a decisive battle and Antiochus left to start a campaign in Mesopotamia. He gained control over Seleucid territories in Asia Minor north of the Taurus Mountains. He repulsed several attempts by Seleucus III Ceraunus, who had succeeded Seleucus II, to recover the lost territory. In 223 Seleucus III crossed the Taurus, but was assassinated. Achaeus assumed control of the army. Antiochus III the Great then made him governor of Seleucid territories north of the Taurus. Within two years he recovered the lost territories and forced Attalus within the walls of Pergamon. 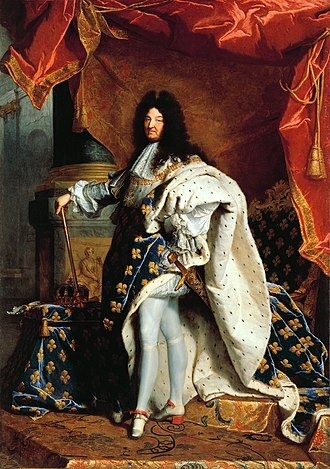 However, he was accused of intending to revolt and to protect himself he proclaimed himself king. In 218 BC Achaeus undertook an expedition to Selge, south of the Taurus. Attalus recaptured his former territories with the help of some Thracian Gauls. Achaeus returned from his victorious campaign in 217 BC and hostilities between the two resumed. Attalus made an alliance with Antiochus III, who besieged Achaeus in Sardis in 214 BC. Antiochus captured the city and put Achaeus to death in the next year. Attalus regained control over his territories. The Attalids became allies of Rome during the First Macedonian War (214–205 BC) and supported Rome in subsequent wars. Attalus I, who had helped the Romans in the first war, also provided them with assistance in the Second Macedonian War (200–197 BC). 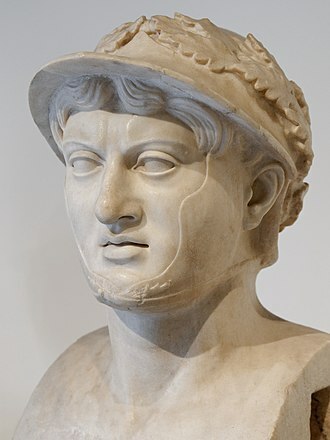 Eumenes II (reigned 197–159 BC) supported Rome in the Roman–Seleucid War (192–188 BC) and in the Third Macedonian War (171–168 BC)  In 188 BC, after the war against the Seleucids, the Romans seized the possessions of the defeated Antiochus III the Great in Asia Minor and gave Mysia, Lydia, Phrygia, and Pamphylia to the kingdom of Pergamon and Caria Lycia and Pisidia, in the southwestern corner of Asia Minor, to Rhodes, another Roman ally. Later the Romans gave these possessions of Rhodes to Pergamon. Before he became king, Attalus II was a military commander. In 190 BC he took part in the Battle of Magnesia, which was the final victory of the Romans in the war against the Seleucids. In 189 BC he led the Pergamene troops which flanked the Roman Army under Gnaeus Manlius Vulso in the Galatian War. In 182–179 BC, he was at war with Pharnaces I of Pontus. 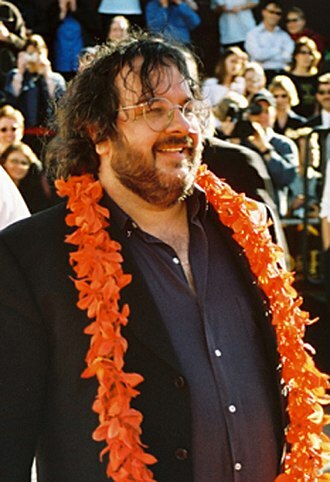 He won victories and gained some territory. He acceded to the throne in 159 BC. In 156–154 BC he made war against Prusias II of Bithynia with the help of the Romans. In 154 BC he was also assisted by Ariarathes V of Cappadocia, who provided troops led by his son Demetrius. 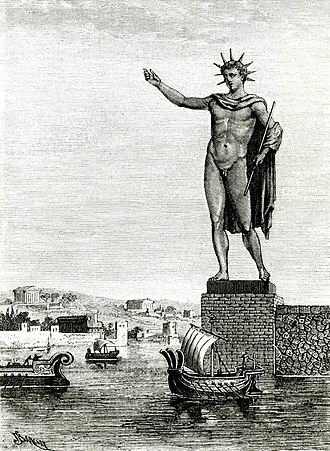 Attalus expanded his kingdom and founded the cities of Philadelphia and Attalia. In 152 BC the two kings and Rome helped the pretender Alexander Balas to seize the Seleucid throne from Demetrius I Soter. In 149 BC, Attalus helped Nicomedes II Epiphanes to seize the Bithynian throne from his father Prusias II. 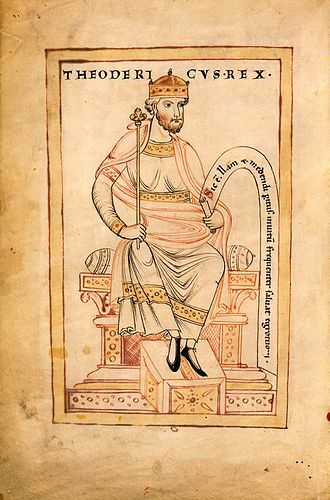 The last Attalid king, Attalus III died without issue and bequeathed the kingdom to the Roman Republic in 133 BC. 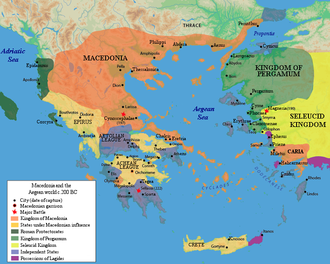 The Romans were reluctant to take on territory in Asia Minor and did not take charge of the kingdom. Aristonicus, claimed to be the illegitimate son of Eumenes II, assumed the dynastic name of Eumenes III, claimed the throne, instigated a rebellion and in 132 BC "occupied Asia, which had been bequested to the Roman people and was supposed to be free". In 131 BC Rome sent an army against him which was defeated. The Romans defeated Eumemes III in 129 BC. They annexed the former kingdom of Pergamon, which became the Roman province of Asia. In the interior of the Pergamon Altar there is a frieze depicting the life of Telephus, son of Herakles. The ruling dynasty associated Telephus with its city and used him to claim descent from the Olympians. Pergamon, having entered the Greek world much later than its counterparts to the west, could not boast the same divine heritage as older city-states and so had to cultivate its place in Greek mythology retroactively. ^ Shipley, The Greek World After Alexander, 323–30 B.C., pp. 318–319. Caria was a region of western Anatolia extending along the coast from mid-Ionia south to Lycia and east to Phrygia. The Ionian and Dorian Greeks colonized the west of it and joined the Carian population in forming Greek-dominated states there, the inhabitants of Caria, known as Carians, had arrived there before the Greeks. 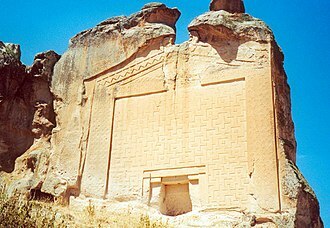 The Carians did speak an Anatolian language, known as Carian, cramers detailed catalog of Carian towns in classical Greece is based entirely on ancient sources. 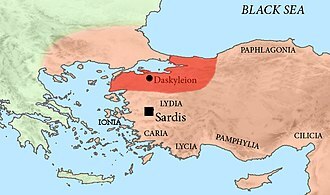 The multiple names of towns and geomorphic features, such as bays and headlands, coastal Caria begins with Didyma south of Miletus, but Miletus had been placed in the pre-Greek Caria. South of it is the Iassicus Sinus and the towns of Iassus and Bargylia, giving a name of Bargyleticus Sinus to Güllük Körfezi, and nearby Cindye. After Bargylia is Caryanda or Caryinda, and on the Bodrum Peninsula Myndus,56 miles miles from Miletus, in the vicinity is Naziandus, exact location unknown. On the tip of the Bodrum Peninsula is Termera, and on the other side Ceramicus Sinus and it was formerly crowded with numerous towns. Halicarnassus, a Dorian Greek city, was planted there among six Carian towns, Sibde, Euranium, Pedasa or Pedasum and these with Myndus and Synagela constitute the eight Lelege towns. Also on the north coast of the Ceramicus Sinus is Ceramus and Bargasus, on the south of the Ceramicus Sinus is the Carian Chersonnese, or Triopium Promontory, called Doris after the Dorian colony of Cnidus. At the base of the peninsula is Bybassus or Bybastus from which an earlier names and it was now Acanthus and Doulopolis. South of the Carian Chersonnese is Doridis Sinus, the Gulf of Doris, there are three bays in it, Bubassius and Schoenus, the last enclosing the town of Hyda. In the gulf somewhere are Euthene or Eutane, Pitaeum, on the south shore is the Cynossema, or Onugnathos Promontory, opposite Symi. South of there is the Rhodian Peraea, a section of the coast under Rhodes and it includes Loryma or Larymna in Oedimus Bay, Tisanusa, the headland of Paridion, Panydon or Pandion with Physicus, Physca or Physcus, called Cressa. Pisidia was a region of ancient Asia Minor located north of Lycia, bordering Caria, Lydia and Pamphylia, and corresponding roughly to the modern-day province of Antalya in Turkey. Among Pisidias settlements were Termessus, Cremna, Etenna, Neapolis, Laodiceia Katakekaumene, although close to Mediterranean Sea on the map, the warm climate of the south cannot pass the height of the Taurus Mountains. Owing to the climate, there is no timberland but crop plants grow in areas provided with water from the mountains, the Pisidian cities, mostly founded on the slopes, benefited from this fertility. The irrigated soil of the land is suitable for growing fruit. The area of Pisidia has been inhabited since the Paleolithic age, at that time, Pisidia appears to have been part of the region the Hittites called Arzawa. The Pisidian language is known, but is assumed to be a member of the Anatolian branch of Indo-European languages. Pisidians are known to be among the nations which helped the Persians in their war against Greece, there can be little doubt that the Pisidians and Pamphylians were the same people, but the distinction between the two seems to have been established at an early period. Pamphylia early received colonies from Greece and other lands, and from this cause, combined with the fertility of their territory. Pisidia remained a wild, mountainous region, and one of the most difficult for outside powers to rule, as far back as the Hittite period, Pisidia was host to independent communities not under the Hittite yoke. 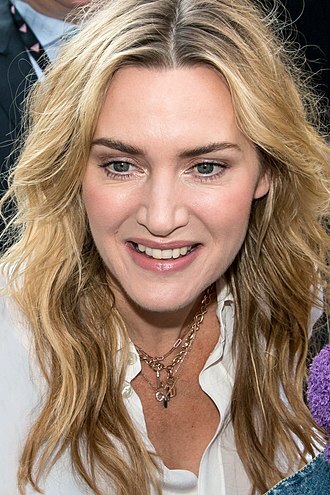 Alexander the Great had somewhat better fortune, conquering Sagalassos on his way to Persia, under the Selucids Greek colonies were founded at strategically important places and the local people Hellenised. Even so, the Hellenistic kings were never in complete control, the cities in Pisidia were among the last in western Anatolia to fully adopt Greek culture and to coin their own money. 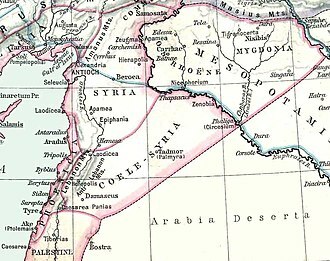 Pisidia officially passed from the Selucids to the Attalids as a result of the Treaty of Apamea, forced on Antiochos III of Syria by the Romans in 188 BC. After Attalos III, the last king of Pergamon, bequeathed his kingdom to Rome in 133 BC as the province of Asia, Pisidia was given to the Kingdom of Cappadocia, the Pisidians cast their lot with pirate-dominated Cilicia and Pamphylia until Roman rule was restored in 102 BC. Lycia was a geopolitical region in Anatolia in what are now the provinces of Antalya and Muğla on the southern coast of Turkey, and Burdur Province inland. Known to history since the records of ancient Egypt and the Hittite Empire in the Late Bronze Age, written records began to be inscribed in stone in the Lycian language after Lycias involuntary incorporation into the Achaemenid Empire in the Iron Age. At that time the Luwian speakers were decimated, and Lycia received an influx of Persian speakers, Lycia fought for the Persians in the Persian Wars, but on the defeat of the Achaemenid Empire by the Greeks, it became intermittently a free agent. Due to the influx of Greek speakers and the sparsity of the remaining Lycian speakers, the Lycian language disappeared from inscriptions and coinage. On defeating Antiochus III in 188 BC the Romans gave Lycia to Rhodes for 20 years, in these latter stages of the Roman republic Lycia came to enjoy freedom as part of the Roman protectorate. The Romans validated home rule officially under the Lycian League in 168 BC and this native government was an early federation with republican principles, these came to the attention of the framers of the United States Constitution, influencing their thoughts. Despite home rule under republican principles Lycia was not a state and had not been since its defeat by the Carians. In 43 AD the Roman emperor Claudius dissolved the league, Lycia was incorporated into the Roman Empire with a provincial status. It became an eparchy of the Eastern, or Byzantine Empire, after the fall of the Byzantine Empire in the 15th century, Lycia was under the Ottoman Empire, and was inherited by the Turkish Republic on the fall of that empire. The Greeks were withdrawn when the border between Greece and Turkey was negotiated in 1923, Lycia comprised what is now the westernmost portion of Antalya Province, the easternmost portion of Muğla Province, and the southernmost portion of Burdur Province. In ancient times the surrounding districts were, from west to east, Caria and Pamphylia, all equally as ancient, and each speaking its own Anatolian language. The name of the Teke Peninsula comes from the name of Antalya Province. Four ridges extend from northeast to southwest, forming the western extremity of the Taurus Mountains, furthest west of the four are Boncuk Dağlari, or the Boncuk Mountains, extending from about Altinyayla, southwest to about Oren north of Fethiye. Electrum stater of Cyzicus, mid 4th century BC. 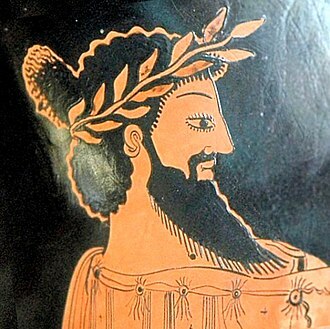 On the obverse is a possible portrait of Timotheos, wearing a victory wreath, with a tuna fish below. 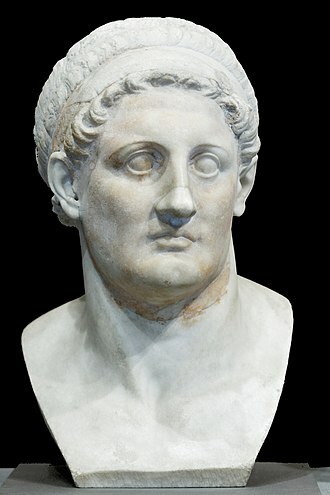 Marble bust of Philetaerus. 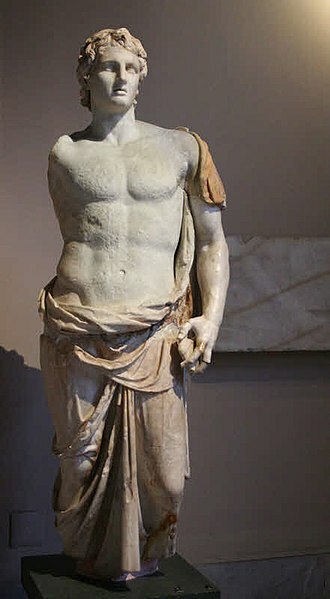 Roman copy from 1st century AD of the Greek original. 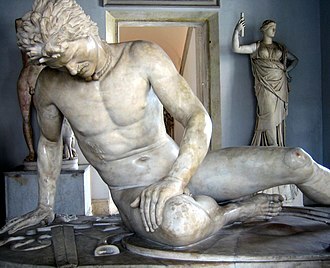 Naples National Archaeological Museum. 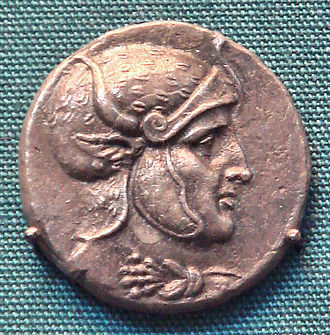 Coin of Eumenes. Cabinet des Médailles, Paris.